From the start, my plan for the series of mysteries set in Victorian San Francisco has been that each book should feature a different occupation held by women of that period. In Maids of Misfortune, my protagonist, Annie Fuller, goes undercover as a domestic servant, in Uneasy Spirits, she investigates a fraudulent trance medium, and in my short story, The Misses Moffet Mend a Marriage, the elderly seamstresses who live in Annie Fuller’s boarding house are on center stage. In Dandy Detects, it is another boarder, Barbara Hewett, who is the main protagonist. And it was while I was developing her background story, including her work as a teacher at the city’s Girls’ High, that I decided that my next full-length book after Uneasy Spirits would be about the teaching profession. In less than two weeks, that book, Bloody Lessons, will be published, and for those who like to know more about the historical background of my fiction, I am going post a multiple-part series on San Francisco teachers in the late 19th century. Most of this material is drawn from my dissertation, ‘Like Machine or an Animal:’ Working Women of the Far West in the Late Nineteenth Century and the San Francisco Chronicle. “Less than ten percent of all the women working in San Francisco, Portland, and Los Angeles in 1880 held jobs in the professions, and over ninety percent of them were teachers. Fifty years earlier school teaching had been dominated by men; women had begun to join the profession in significant numbers as full-time teachers only in the 1840s, and yet by 1880 over two thirds of the teachers in the United States were women. “Western school boards hired women as teachers for all of these reasons. Urban leaders in the Far West felt that it was imperative to provide up-to-date institutions in their cities to prove that their region was a modern as the East. With rapidly growing populations, however, it was often difficult to secure the funds necessary to set up good public school systems. All three cities witnessed battles over the issue of school funding in the 1850s and 1860s; hiring women seemed an acceptable solution to these problems in the Far West as well. While I knew the general outline of the problems facing women teachers from my dissertation work, the research I did last year in preparation for writing Bloody Lessons proved extremely enlightening. A search of the San Francisco Chronicle for 1879-1880 exposed the fact that in December 1879, just a month before Bloody Lessons opens, the newly elected city school board, in an attempt to cut the costs of public education, slashed the salaries of the primary school teachers––in some cases cutting their monthly salaries in half. Previously, a teacher’s salary was determined by the grade they taught (lower grades, lower salary), supplemented by the number of years teaching experience they had and what level of teaching certificate they had obtained through a statewide examination. Now, the base salary of primary school teachers base was lowered and their experience and training would not be taken into consideration. They also argued that the new method of calculating salaries would drive the most experienced teachers out of the city’s public school system––or force them to refuse positions in the primary school grades. However, it was clear from the Board’s decision to cut salary of the teachers in the lowest grades the most (and another proposal to have unpaid Normal school students substitute in these grades), that these men had accepted the common rational for paying women less––that women were simply exercising their natural maternal instincts with young students––hence their experience or education shouldn’t count. As a retired teacher, I must say I found this battle over teachers’ salaries distressingly familiar, echoing the recent controversies and cut-back facing public school teachers throughout the nation. There was even an “Anti-Tax Pledge” that all the Republican School Board members had taken during the previous election that had prompted the cut in salaries. However, as a novelist, I couldn’t have been happier. I wasn’t going to have to invent a sense of crisis among my characters, it was already there, waiting for me to discover and turn into a mystery plot as I wrote Bloody Lessons. 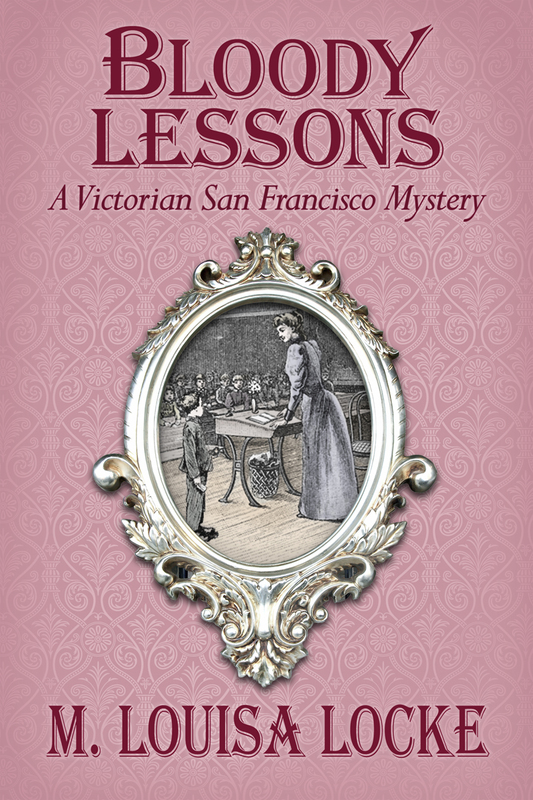 Bloody Lessons the third book in my Victorian San Francisco Mystery series is due out September 15 in print and ebook on Kindle, and it is available for pre-order here. I really enjoy your historical background posts. This one sent me off on a quest to find out more about Isaac Kalloch. As you might guess from my nom de plume, I am particularly fascinated by religious leaders who become involved in politics. Kalloch certainly had a colorful career. Proof from author M. Louisa Locke that America has abused its teachers for more than a century. Click and read her entire post. After reading Locke’s post, President Bush’s “No Child Left Behind” and Obama’s “Race to the Top” makes sense—just more abuse of teachers. America has always had someone to kick around and blame for cultural flaws and problems, and in the early 21st century, teachers have been the target more than ever.